Burberry's Christmas campaign proves so popular fans call for a feature film | HELLO! Burberry's new Christmas campaign video has proved such a hit with fans that many have called for it to be made into a feature-length film. 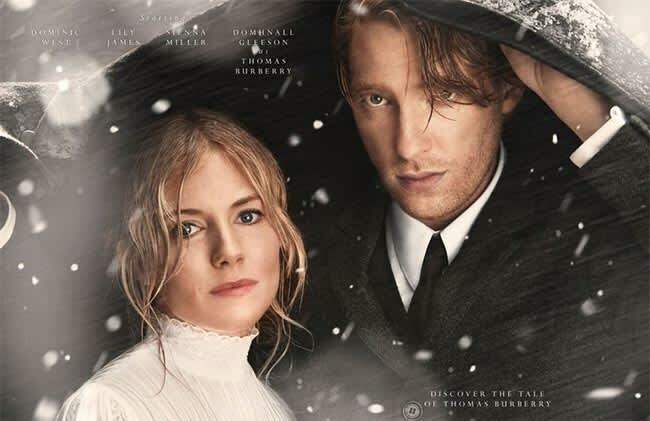 Sienna Miller, Domhnall Gleeson, Lily James and Dominic West all star in the three-minute video, called The Tale of Thomas Burberry, which celebrates the life of the Burberry founder. Written by Matt Charman and directed by Academy Award winner Asif Kapadia, the clip looks like a trailer for a big budget film. And now many fans – including star Lily James – have said they want to see the campaign transformed on the big screen. "I want there to be a full movie," Lily told WWD. "And with the amount of footage we shot, I'm sure they could have made a film. We invested in the characters and it was shot like a normal film." Other fans shared their opinions of the campaign on Twitter. "Can we have a feature film of the new Burberry advert please?" one wrote, while another commented: "Actually wish that @Burberry film was going to be a full length feature. I honestly need more than 3 mins of this…"
The Christmas campaign follows Thomas Burberry (Domhnall) as he launches his own business, with Sienna and Lily taking on the fictional roles of his wife and pilot Betty Dawson respectively. Meanwhile Dominic plays Burberry patron and polar explorer Ernest Shackleton, whose 1914 expedition to the Antarctic forms the central plotline. Speaking about the campaign, Burberry's chief creative and chief executive officer Christopher Bailey said it was in honour of the brand's 160th anniversary. "This Christmas, as we celebrate our 160th anniversary we wanted to tell the story of Thomas Burberry - pioneer, inventor, innovator, and the man behind the iconic trench coat – in our own words," he said. "The film we have made is a brief glimpse inspired by his full and extraordinary life, which threaded its way through the history of the twentieth century in all its tumultuous highs and lows."